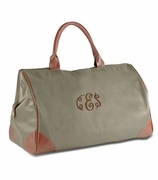 Personalized quilted duffle bag for women. Fashionable duffle in an Ikat navy, green and orange-coral design that will add the latest style to your bag collection. A fun look and color combination for the weekend get-a-away. Lightweight and quality construction. 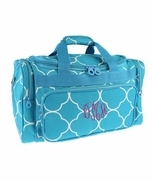 Personalized duffle bag for women measures 20"W x 11"H x 10" across the bottom. Sturdy foot bottom. Outside zip pocket and zipper closure. I ordered this personalized bag on a Thursday night and received it on Monday morning. Super fast shipping! The bag is high quality and exceeded my expectations. Very impressed! 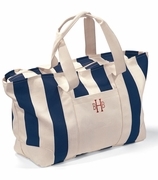 This is a great bag! I already have one and use it to travel for a short weekend getaway or as my carry on bag when I fly. It fits perfectly under the seat in front of you and very comfortable to tote around the airport. I ordered this one for my friend who will be getting married soon. Thought it would be nice for her to have something with her new initials to use on their honeymoon!